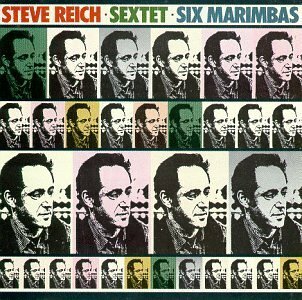 Steve Reich, Sextet, from Sextet/Six Marimbas, performed by Steve Reich and Musicians with members of Nexus and the Manhattan Marimba Quartet. After Music for Eighteen Musicians, my favorite piece by Steve Reich may be Sextet, because it explores more dissonant harmonies and aggressive rhythms while maintaining a similar luminous purity - a purity I find somewhat obscured by vocals and string instruments in some of his other works. His style of building pieces by gradually expanding and modifying repetitve rhythmic blocks works very well with the clear sounds he uses here: pianos, marimbas, and the unusual bowed vibraphones. In fact you could say music is another way of thinking, or maybe thinking is another kind of music. Sextet (1985) is in five movements played without pause. The relationship of the five movements is that of an arch form A-B-C-B-A. The first and last movements are fast, the second and forth moderate, and the third is slow. Changes of tempo are made abruptly at the beginning of new movements by metric modulation to either get slower or faster. Movements are also organized harmonically with a chord cycle for the first and fifth, another for the second and fourth, and yet another for the third. The harmonies used are largely dominant chords with added tones creating a somewhat darker, chromatic, and more varied harmonic language than in my earlier works. Both the cyclical movement structure and the general harmonic language were suggested by my recently completed work, The Desert Music (1984). Percussion instruments primarily produce sounds of relatively short duration. In Sextet I was interested in overcoming that limitation. In the second movement, the use of the bowed vibraphone, not merely as a passing effect but as a basic instrumental voice, was one means of getting long tones. The use of the synthesizer as electric organ supplied long continuous sounds not possible with the piano. The mallet instruments (marimba, vibraphone etc.) are basically instruments of high and middle register without a low range. To overcome this limit the bass drum was used, doubling piano or synthesizer played in their lower registers, particularly in the second, third, and fourth movements. Compositional techniques used include some introduced in my music as early as Drumming in 1971. In particular, two or three players on identical instruments substituting beats for rests to build up repeating patterns in canon with each other, is used extensively in the first and last movements. Sudden change of rhythmic position (or phase) of one voice in an overall repeating contrapuntal web first occurs in my Six Pianos of 1973 and occurs throughout this work. Double canons, where one canon moves slowly (the bowed vibraphones) and the second moves quickly (the pianos), first appeared in my music in Octet of 1979. Techniques influenced by African music, in which the basic ambiguity in meters of 12 beats between three groups of four and four groups of three, appear in the third and fifth movements. A rhythmically ambiguous pattern is played by the vibraphones in the third movement and accented sometimes in four and sometimes in three by the pianos. This occurs similarly in the fifth movement, but at a much faster tempo. The result is to change the perception of what is in fact not changing. Another related, more recent technique that appears near the end of the fourth movement is to gradually remove the melodic material in the synthesizers, leaving the accompaniment of the two vibraphones to become the new melodic focus. Similarly, the accompaniment in the pianos in the second movement becomes the melody for the synthesizers in the fourth movement. The ambiguity here is between which is melody and which is accompaniment. In music that uses a great deal of repetition, I believe it is precisely these kinds of ambiguity that give vitality and life. Though I've loved it for a long time, I was inspired to add this piece to my list of favorites today because an interview with Steve Reich appeared on National Public Radio, in which he discusses his latest pieces - You Are (Variations) and Cello Counterpoint. You can read a longer interview with him on American Mavericks. I'd say he's the best classical composer alive today (whatever that means).